For a short while now, the San Francisco Chronicle has been running a short feature in its book review called "Special edition: Most treasured book." Earlier contributors have included novelist Isabel Allende, actor Peter Coyote, science writer Mary Roach, linguist Geoffrey Nunberg and other mostly local luminaries. Each contributor is given approximately 100 words to tell about their most treasured volume. Because of these constraints, it is a difficult assignment; however, because of its topic, it is also an easy assignment. This is the book we value the most, and we want to tell the world about it. I recently had the honor of being asked to contribute. (The "I" in this case is Book Passage staffer Thomas Gladysz.) 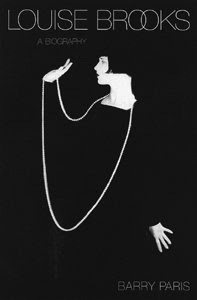 My most treasured book is Louise Brooks, by Barry Paris. First published by Knopf in 1989, it is the biography of a silent film star. I am sure you might recognize her image. She is something of an icon, and there have been other books both by and about her.